Over two days, I have been showing my lovely Australian clients the 'best of' small apartments in Nice, handpicked by me in advance. The budget was under 200,000 euros, which is always a challenge, but I like a challenge. It takes time to find the good ones, but before clients arrive I have sorted the quality ones from the bad so there is no wasting of their time and no nasty surprises. I cut through the agent hard-sell, and cut out altogether the properties that agents want to shift because they are not selling. An agent asked me recently why I did not show clients the really bad ones as she considers this a great tactic to get people to buy (they then see a respectable one and think 'Oh, this is so much better.'). A client also asked the same question. He was so impressed by what I had shown him (having been taken around the usual rubbish by agents) he thought it would be a good way to show off my detective skills. My answer is that I'm not an agent working for the seller. My loyalties are to my client, the buyer. They trust me to have done the ground-work and not waste their time. If they want to see bad properties, then I suggest they go round the agents. However, if they want to see the best properties in budget, unique properties, properties that are fairly priced, ones that are hard to track down .... then that's my job. In all, I set up ten viewings for my Australians. They ranged from studios to one bedrooms. But each one had something I thought made it worthwhile. They liked the Old Town and could see the investment potential, but the one that won their hearts (and business-sense) is a top-floor studio with a big terrace that I first viewed on Friday (and wrote about in my last blog entry). It just had to be this one. We put in an offer Wednesday and it was accepted the next day. I negotiated 13,000 euros off the asking price. It's with a Syndic (building management company) so not on any agent's books. Not an easy find. Although I spend a lot of time working out what will suit my clients best, I try not to pre-judge too much until we have actually spent some time together. Things change when you are on the ground. But regardless of likes or dislikes, business versus heart, this rooftop apartment was special. And special in the under 200,000 Euro bracket doesn't come along very often. 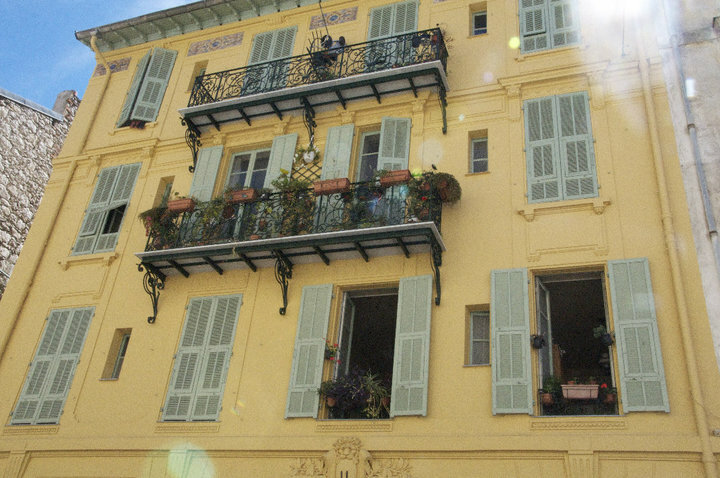 A small apartment and small budget in Nice doesn't mean you have to settle for any old thing. Don't believe the agents when they say this is the best you can get. Trust me, there will often be better but you need to know what to look for and how to find it. It's hard to uncover something unique, that's for sure, but at the very least it has to be a good investment. For me this means it needs to be bigger than a shoe-box (I prefer 30 sq metres, if possible more), in a good location, preferably one bedroom and if small then I look for other advantages such as upper floors, balconies, architectural charm. The roof-top studio came under my 30 sq metre rule (it's 28 sq metres), but it is top floor with French windows on three sides, a terrace on all sides, marble floors, and a small turn-of the century marble fireplace. The building has one of those wonderful cage lifts. It's adorable. As I said to my delighted Australians, 'it's small but perfectly formed'. And that (and, of course, location) is the best guide when looking for a small apartment in Nice.